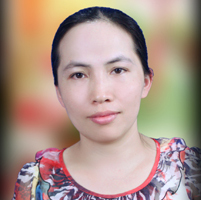 Le Thi Thuy Hang is in charge of administration and human resources for Project RENEW. She joined Project RENEW in 2004 and worked with the Mine Risk Education program until 2011. Prior to that, she worked at the provincial Department of Taxation. Hang holds a B.A degree in planning and development from Hanoi University of Economics. She has participated in a number of national and international training courses.